After about four months of beta test, the final version of the free racing game Forza Motorsport 6 Apex for Windows 10 is out as a finished product in the store, write the developer of Turn 10 Studios on the official Forza Motorsport website. With an update, the developers integrate the support of steering wheels. Below you can see a list of compatible racing wheels models featuring Forza Motorsport 6: Apex. According to the developers, more Steering Wheels models will be added in the future. Especially, you may use steering wheel from the manufacturer Fanatec. 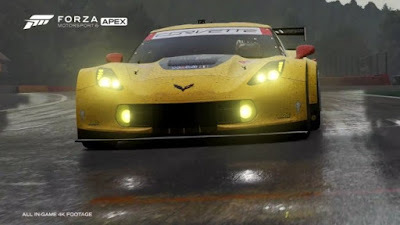 Forza Motorsport 6: Apex comes with more than 60 vehicles (in Forza Motorsport 6 for Xbox One, there are more than 450 vehicles) and a number of tracks. The game supports DirectX 12 and resolution in 4K. The known Forza features Drivatar and Forza Vista are also in Forza Motorsport 6: Apex. Lest us see the PC system requirements of the game. Your PC requires Windows 10 with 64-bit and DirectX12. At least one Intel Core i3-4170 with 3.7 gigahertz (GHz) processor, eight gigabytes (GB) of RAM and 30 GB hard disk space. The graphics card you need at least an Nvidia GeForce GT 740 or AMD Radeon R7 250X. However, the ideal setting for a reversal of 4K at 60 frames per second (FPS), you should have better hardware. The system requires a processor type Intel Core i7-6700k four Ghz and NVIDIA GeForce GTX 980ti. Alternatively, it comes with an AMD Radeon Fury X. There are also a SSD hard drive with 30 gigabytes of free storage, 16 gigabytes of memory and six gigabytes of graphics memory are recommended.